Pop megastar Lady Gaga is well known for her outrageous costumes which includes the regular use of wigs. 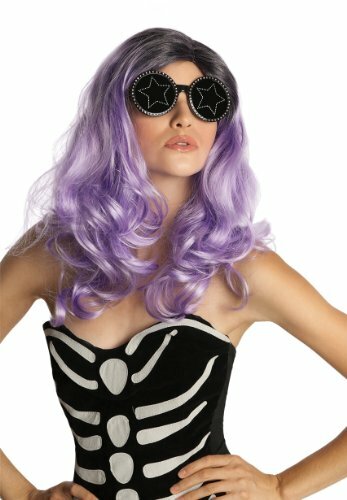 I’ve compiled a number of Lady Gaga costume wigs for you to choose from if you want to copy her Gagalicious look for a night out or even a fancy dress event. Some of Lady Gaga’s wigs have become quite iconic within pop culture history – who can forget the hair bow or the soda can hair for example? Other Lady Gaga wigs just helped her to create a particular look when worn with her different outfits. Lady Gaga’s first hit was Just Dance and her costumes for this single’s videos weren’t nearly as outrageous as what were to come……..she had, however, begun wearing a wig. 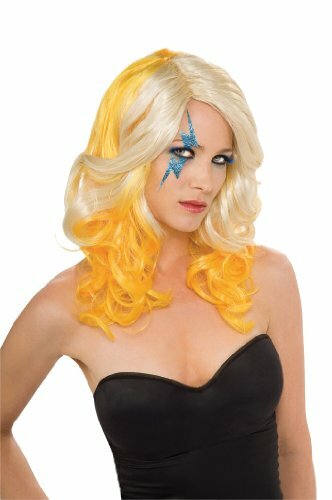 Lady Gaga’s long, straight blonde hair with bangs was courtesy of a wig like the one on offer here that is part of her official costume range. She often accompanied this wig with a blue lightning bolt on her face and when she performed the song live she was often seen with a Lady Gaga style hood over the hair. 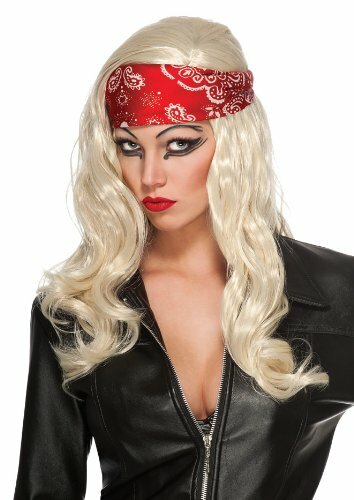 She also seemed to like wearing her long blonde wig in conjunction with a more famous hair piece of hers……the hair bow! The next hair variation that Lady Gaga was seen sporting came about around the same time and is the hair bow. Now there are various ways of achieving this – the wig, the bow itself or even creating the look with your own hair (if you have long hair that is). 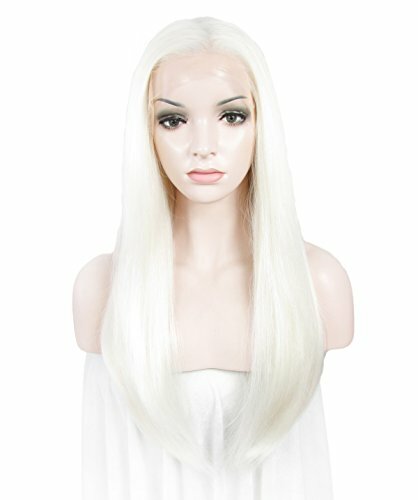 I think buying the hair bow is the easiest solution and you can then attach it to the long straight blonde wig with bangs that we featured first or with a short blonde bob. Now most people are aware of Lady Gaga’s hair bow as being part of her long, blonde look as she used it several times (especially in her various origami prom dresses). However she has been photographed in a short blonde bob wig with the hair bow as well. Many of Lady Gaga’s best looks come when she does photo shoots and I loved the image of her as a lilac bunny that appeared on the cover of Spanish magazine Neo2, unfortunately I can’t find a copyright free image to show you here so if you want to see the look she created you’ll have to click on – Lady Gaga’s Lilac Bunny Look. In the same year (2009) she also treated her British fans to the first peep at her long purple wig. This was around the same time that she started carrying a china tea cup around with her – gotta love her whimsy! After the success of her Telephone video Lady Gaga released some official costumes along with some wigs – two of which had already been featured in her Telephone Video like this one here. How to create the soda can hair do was posted to Youtube in record time after the Telephone video was released! This is one of the fun things about Lady Gaga’s ‘look’ people are very quick to work out how to emulate the Mother Monster and share their thoughts with other fans. This next wig from the Telephone video wasn’t as easy to emulate however. 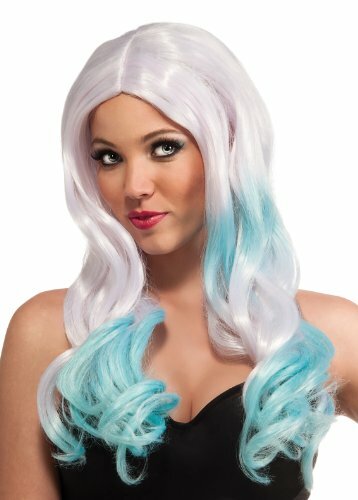 This two tone wig was worn with her USA outfit and quickly became one of the fastest selling Halloween wigs for that year. This was probably because people liked the idea that the costume made Lady Gaga seem almost like a superhero – Lady USA, very patriotic. The next official Lady Gaga wig was based on one that she wore to the VMAs, most memorable for being covered in blood she was sporting this cute wig as well! I must admit I do like the curls and the pink streak in this wig, it creates a much softer look for the Mother Monster. This is the wig in question, minus the meat headdress that Lady Gaga donned on the night she introduced this style to us. The patches of aqua (or turquoise blue) on the long white wig gives a whimsical touch to Mother Monster’s hair. Lady Gaga has certainly donned her share of wigs and we’ve barely scratched the surface so far. She has also played with the two toned wig idea in other ways, sported a side ponytail, a bandana and has even gone green! 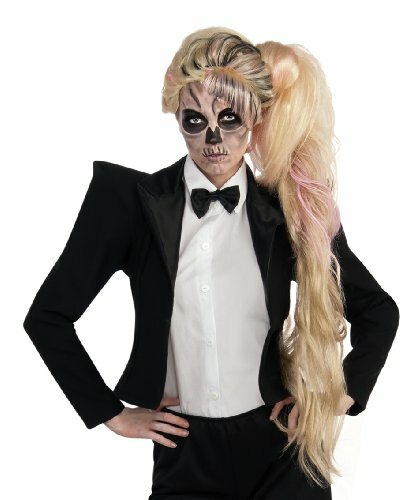 I’m including a few more wigs here for you to help complete a gorgeous Lady Gaga costume for yourself whether it’s for one of her concerts, a fancy dress event or Halloween – enjoy! This entry was posted in Costumes, Wigs and tagged lady gaga costume ideas by Lou. Bookmark the permalink.